For no one ought play with their boy. You may remember that I made a video for Etsy earlier this year. I made some paper people in that video. Now I've opened a shop for them. And I've listed a gnome. He popped into my head a few days ago, but being swamped with end-of-semester projects, I wasn't able to work on him until yesterday. Spent the better part of the afternoon, measuring, slicing, rolling and gluing. When that moment came when he became reality and looked like the little gnome in my head it was truly magical. I love those moments. His name is Theodrin. 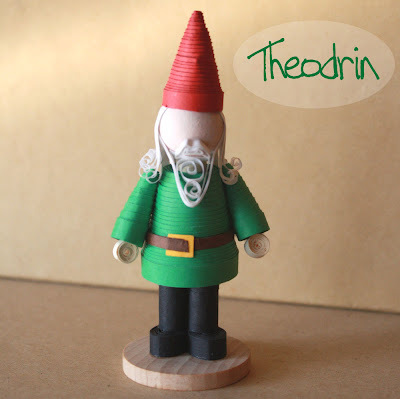 You can read all about him at Minifolk.